Cost to install a solar water heater varies greatly by region (and even by zip code). Get free estimates from solar energy contractors in your city. Cost to install a solar water heater varies greatly by region (and even by zip code). The average cost of installing a solar water heater is $6,000 - $17,000. How much does it cost to install a solar water heater? Solar water heaters are also referred to as solar domestic hot water systems. The device is a cost-efficient way to heat water using the thermal power of sunlight. A solar water heater has a water storage tank and solar collectors. Installing a standard hot water heater does not increase the value of your home, but the addition of a solar hot water heater can increase your home’s value by 25 percent. Average houses use 20 to 25 gallons of water per person and day, so you will need a tank that can heat 100 gallons of water for a family of four. The average 100-gallon solar active indirect hot water heating system costs from $8,000-$10,000 when fully installed with a collector. Many homeowners hesitate to install a solar hot water heater because the initial upfront cost of installation and purchase is considerably more than a standard hot water heater. However, there are a variety of pros and cons that might influence your decision. Prior to purchasing your solar water heating system, you will need to think about your home’s location and access to sunlight. The efficiency and design of the solar heating system require that it receive enough sunlight to function. A solar water heating system utilizes both direct and diffuse radiation from sunlight. Many people worry that they cannot use a solar water heater because they live in an area of the country that is cloudy much of the year, or otherwise struggle with bad weather, but there still may be enough sunlight to effectively power the system. Any area that is unshaded and faces south is a viable choice for a solar water heating system. However, in northern regions where there is much less direct sunlight during the winter time, the system may not adequately heat enough water throughout the day. In such locations, many people choose to have a standard water heater and a solar water heater to ensure they have enough hot water. The use of a solar heating system to warm the water of a swimming pool does not affect the cost. The process still relies on the power of solar to heat the water. Many people also use a solar water heater to help radiant floor heating 1. 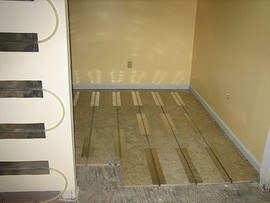 The cost of running radiant floor heating is comparable to that of heating water for a household. Solar hot water heaters are available in numerous designs, but all include collectors and a storage tank. An active system uses either direct or indirect circulation. 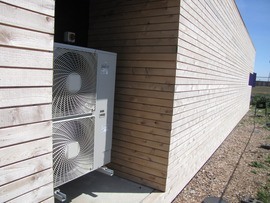 A direct system has a pump that circulates the water through the collectors to heat the water. With an indirect system, the water does not circulate through the collectors. The indirect system uses a non-freezing heat-transfer fluid in place of the water. The heat transfer fluid flows through the collectors to absorb the sun’s solar warmth and then travels into the storage tank to heat the water Naturally, the indirect system is very complex and typically only used in areas that experience freezing temperatures. A passive system is far less efficient and often only used to preheat water for a conventional hot water system. In such a system, natural convection is used to circulate the water so the tank must be placed higher than the collection panels so that the water flows upward to the tank and the cold water flows down for heating. This system only functions in areas that never deal with freezing weather. There are two types of solar hot water heaters: active (indirect and direct) and passive (integral collector-storage or thermosyphon). Active systems rely on pumps 2 to move the water, but passive systems rely on natural convection. An indirect active system uses the main furnace or boiler to heat the heat-transfer fluid so it circulates through the heat exchanger to heat the water in the storage tank. A direct active system pushes the actual water through the collectors to heat for the storage tank. A passive integral collector-storage requires no pumps and is entirely passive. They are a single unit that consists of a tank with a collector. Can only be used in areas with mild or warm weather. There are numerous parts involved in a solar water heater, depending on what type you purchase. In general, the system includes a collector, which is the flat apparatus that gathers the sun’s thermal energy. These are normally placed on the home’s roof in a south-facing location. In an active system, there is a built-in pump that moves the water or heat transfer solution through the tubes, to the the collector, and back to the tank. The heat exchangers are built in and transfer the sun’s thermal energy, absorbed in the collectors, to the liquid or air used to heat the water. 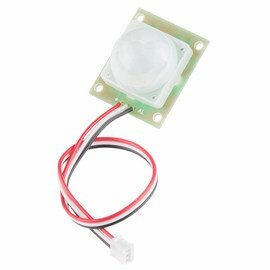 Depending on the solar heating system that you purchase, you will be provided with controllers that offer a range of features such as sensor 3 inputs, remote monitoring, and relay controls. You can usually choose between a double- or single-walled tank. The double-walled offers more insulation. Double-walled are for regions that have hard freezes. All systems come with the plumbing that connects the collector to the tank. The plumbing also comes equipped with shutoff switches that can be used during repair or maintenance. You can choose from single- or double-walled tanks for your solar water heating system. 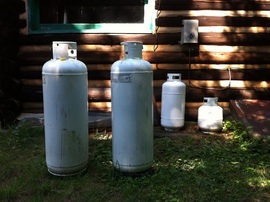 The tanks typically range in size from 60 gallons to 120 gallons. The tank is typically paired with a backup electric or gas heat source so you don’t have to worry about taking a cold shower during the night or when there is no sunlight readily available to heat the water. You can choose from simple storage-only tanks, indirect backup tanks that come with a built-in heat exchanger, or a direct tank with built-in auxiliary heat. A basic 60-gallon tank averages $2,000 and goes up to $5,000 for a tank with a built-in heat exchanger or auxiliary heat that holds 120 gallons of water. Prior to embarking on the installation process, your installer should do a solar site analysis to determine the expected efficiency. At that time, they will also determine the correct orientation and tilt of the solar collectors to make sure that they will optimally heat the water in your solar hot water tank. Also, a determination of how many solar collectors you will need to purchase to adequately utilize the sun’s existing rays will be reached. These services are typically included in the cost of installation. You will want to choose a company that specializes in installing solar hot water systems. Normally, the place where you purchase the unit will have contractors available to install the system. You may need to hire a general plumber to run the necessary plumbing. Most companies charge from $2,000-$4,000 for installation of the system and positioning of the collectors. Solar contractors usually charge an average of $70 per hour. If you decide to have a plumber run plumbing pipes for the storage tank then you will spend $45-$65 per hour for a plumber’s services. Once installed, the solar water heating system requires regular inspections to make sure that the collectors are functioning properly, have no cracks or loose bolts, and to remove any accumulated debris. Some general maintenance that requires visual inspections can be performed by the homeowner, but it is generally recommended that you have a solar maintenance person perform a maintenance every three years. The technician usually charges around $70 per hour. An acidic solution must be circulated through the collectors and pipes every three to five years to prevent corrosion and debris buildup that can clog the pipes. In systems that require antifreeze fueling liquids, the liquids must be checked every three to five years. Many people opt to use a solar water heating system to heat their pool or spa. The system can effectively raise the temperature by about three degrees. The cost to install a pool solar heater typically averages $300-$800. Some solar water heating systems feature a backup heat source that is a water heater. This way you are never out of hot water. If your solar system fails to heat the water throughout the day and night then you will still have hot water located in a hot water tank for your household needs. The price to have a backup heating system for your water installed averages $600-$800. Some people opt to have a tankless water heater installed in place of a tank water heater as a backup water heating source. The price to install a tankless water heater averages $1,500-$2,000. A radiant heat system heats a home using water that has been warmed by the solar water heating system. The rooftop collectors warm the water or heating fluid, which flows back to the tank and then into the radiant floor 1 space coils to warm a home, and can also be used in conjunction with a solar hot water heater. The overall expense of installing a radiant floor heating system averages around $6,000-$14,000 in addition to the cost of the solar hot water heater. A solar water heating system has a life expectancy of 20 years. The solar water heating system can heat up to 40 percent of the average home’s water needs. The use of the system can reduce your home’s yearly water heating energy cost by 50-80 percent, depending on what area of the country you live in. You can enjoy substantial energy savings. Estimates vary, but normally you can expect between 50-70 percent of the hot water you use to be heated solely by the sun, which means your system will rarely rely on the backup heating tank to warm the water. Solar water heating systems are frequently eligible for incentives, rebates, and tax credits. Please check with your local energy provider and state/federal tax system to determine eligibility requirements. Typically, to qualify for a federal tax credit at least half your home’s energy to heat water must be gathered from the solar water heater. You do not have to have a whole house system to qualify. Under the federal tax credit, you can only claim the money that you spent on the solar hot water heater and no other hot water sources within your home. You also cannot claim the credit if you are using the solar water heating system to heat a pool or spa. OG-300 Solar Water Heating System Certification Program gives you proof of compliance that your solar water heating system meets all standards set forth by building codes and incentive programs for North America. They are also used for U.S. Federal tax credits and by the EPA ENERGY STAR program and the California Energy Code. Prior to investing in a solar water heating system, you should always make sure that your site will work for the collectors. Will the collectors receive adequate sunlight from 10 am to 4 pm year round? Will your home’s roof hold the collectors, or will you need a location by your home to place the collectors where they will receive sunlight? You also must determine what type of system will meet your needs. If you live in a cold region then you will want to avoid systems that are prone to freezing. You must investigate your local building codes, HOA regulations, and zoning ordinances before installing a solar water heating system. Not all regions welcome such renewable energy options and many have very strict rules that govern where the collectors can be placed, the load capacity, and other considerations. The installation of a solar water heater system is very complicated and should only be undertaken by a qualified professional. Many things must be taken into consideration when installing a solar water heating system, such as the regional climate, specific building codes, safety, and the availability of solar at the location. Ideally, you should have a qualified solar thermal systems contractor safely and efficiently install your system. A typical four-person household will require only a 100-gallon solar water heater and collectors, which averages $8,000-$10,000. The tank that holds the water can keep the existing warm water warm during the night, but the collectors cannot collect thermal energy to heat additional hot water. They are not nearly as efficient during a cloudy day as they are in full sunlight. How hot do solar water heaters get? The water can exceed 212 degrees Fahrenheit, but typically stays between 120 and 130 degrees Fahrenheit. Yes, they can still heat water on a sunny day, even during the winter months. Do solar hot water systems save money? The use of a solar water system can save an average family of four 50-80 percent of their hot water energy use during a year. How much does it cost to install a solar water heater in my city? Cost to install a solar water heater varies greatly by region (and even by zip code). To get free estimates from local contractors, please indicate yours. This cost guide has been remade, giving a more detailed description of the project. 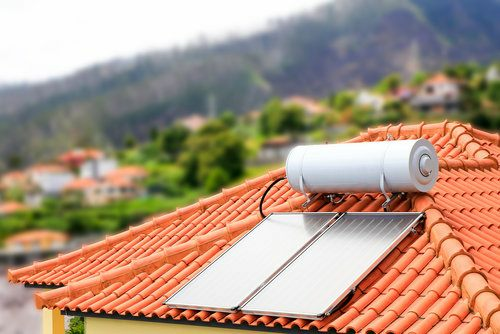 New information was added, such as some factors that affect the price, the benefits of installing a solar water heater, and the different types of solar heaters. There is also information on the different parts of the system, labor involved, and a comparison of solar versus gas and electric water heaters. There is now a section dedicated to enhancement and improvement costs, and another that contains additional considerations, with information regarding life expectancy, energy savings, taxes, certification programs, and regulations. Finally, all prices were updated and a summary stating the price as well as a “FAQ” section were added.